Last January, we spent time in Atlanta Georgia with our friend. Specifically, we spent time in Dekalb County, Georgia, with Andrew, the co-founder of On Our Own Authority Books and his daughter, Olivia. This comic is about them. As part of our crowdfunder for ‘Drawing the Line: Indian Women Fight Back’, Ad Astra Comix agreed to do a workshop in Halifax, Nova Scotia. One of the attendees was Jay Aaron Roy, who runs Cape and Cowl, a comics shop in Lower Sackville, Nova Scotia. We visited C&C on our way back to Ontario and were so impressed that we decided we wanted to do an interview featuring Jay’s work there. The results are below. Q: First off, let’s have the basics: How long has Cape and Cowl been open? Where is it located? What’s the neighbourhood like? A: Cape & Cowl has been open since September 28th, 2014, and we are located at 536 Sackville Drive, in beautiful Lower Sackville, Nova Scotia, Canada! The neighborhood here is warm and welcoming. I am from this town (well, Fall River, which is about ten minutes away), so many community members here have known me, or who I am, for a long time. Q: So when we visited, you told us about the role the shop plays as a community space. Could you tell us a little more about that? A: When I was searching for a location to open, my goal was to specifically open in this rural area to offer the local youth something new to see and do. I have much youth work in my background, and there is hardly anything around here for youth do, so I knew a drop-in center would fit perfectly. I have big ambitions (which I will get to in question #9! ), so having a space where I could host game days, movie nights, youth drop-in times, birthday parties, and the like was always an integral part of my business plan. Q: So you’ve got signs up making it clear that Cape and Cowl is a safe community space. What does that mean in practice? What moved you to do it? A: Safe spaces are so important, especially for the lgbtqi community. Youth desperately need spaces where they feel comfortable and respected. Making my shop a “safe space”, and then advertising that out there to the world, lets all local youth know, and really everyone else too, that this space is protected. Protected by me. Locally, people tend to know that I am an activist who is quite outspoken about the things that I believe in. So, in practice, I offer volunteering opportunities for youth to help me run parties and events, and in return they know that whatever their gender identity or sexual orientation, they will be respected here. And, not only that, but I will make sure that everyone else in the shop respects them as well, and act as a moderator when a person needs to be gently corrected. I basically like to take the stress off the youth and help validate their identity and worth. I have a no-nonsense, zero tolerance rule about bullying. I think it is just a part of who I am, to make a space like this, because I was bullied a lot when I was young, and as I have come out in my adulthood as a transgender man, that bullying hadn’t totally stopped. I don’t know if safe spaces will always be needed, and in some part, I hope we don’t need them forever, but I do know we need them right now. Q: This is an interesting time for nerd culture, with the ugly underbelly of toxic masculinity being dragged out into the light for all to see. Comic book shops are probably the primary physical gathering spaces for people interested in comics, gaming and this kind of stuff – Cape and Cowl is definitely set up like that. But there’s a tension for store owners who have to be careful not to alienate any part of their clientele, while also being pressed to pick sides in an increasingly polarized battle. How do you negotiate that tension at C&C? A: That’s a great question, and certainly something I pay very careful attention to. Every single move I make with the shop is super-meticulously thought out. Where I am the 100% sole proprietor, I feel more free to “do what I want” when it comes to political stances. My shop would never have the chance to be any sort of “boys club”, that’s just not how I operate. I get Sailor Moon toys that have “for girls” printed right on the box…I take a black marker and cover that up right away before they go on the shelf. MY Sailor Moon toys are for EVERYONE. I also reflect my feelings for particular creative teams, in my orders. If I don’t like what a writer/comic is saying to my shoppers, I don’t order it, (unless someone orders it by special request). I really like to showcase representation though, so I’ll still order Superman and Iron Man, but I have way healthier stock of Jem and the Holograms, Ms. Marvel and Moon Girl and Devil Dinosaur. In regards to gathering the local nerds, (and I use that term in a loving way), it is all about timing. I have many community events like craft fairs and bbqs, where the larger community comes out to an event, but also gaming days, where my local Magic: The Gathering players can gather and play tournaments in the drop-in, so I can run my business at the same time. I just make it known to the players that I have a business to run, and for the most part they respect that. I’ve only had to tell a few guys to watch their language, haha. Q: So you used to work at Strange Adventures in Halifax, right? What kind of lessons did you learn there about running a comic shop? Has Callum (the owner of Strange Adventures) been supportive of Cape and Cowl? A: I did used to work at Strange Adventures, and even a few other comic shops as well before that! I learned so much from my time at Strange Adventures, though, for sure. Calum Johnston runs an amazing business, at all three of his shops. I learned a lot about the comic industry from him and Dave Howlett, the manager of his Halifax location. Cal was an awesome boss, and has been super supportive of Cape & Cowl. I am always lead to quote him when he said many years ago to me, “a rising tide floats all boats”. In other words, more people reading comics is a good thing. Also, I’m way out in the rural area, so I don’t hurt his business too much, I imagine. 😉 I still talk to him all the time about lots of different aspects of the business, he has given me some great advice, and brought me gifts of shelving to the shop. Q: What’s your favourite part of running a comic shop? A: What a tough one! First of all, I love being the boss! Haha! I am a pretty creative fellow, so being able to concoct my own sales, events, ideas, etc. has pretty much been a dream come true. I love having the freedom to run my own business the exact way I want to. The most rewarding part of my work is seeing people enjoy the shop, and the space. I also just plain LOVE comics! So, it’s always fun being in the comic industry and seeing what is coming out, the day it comes out! Q: (You can skip this one if you don’t wanna make trouble with your landlord) You mentioned something about the landlord jacking up the rent massively. I think the price you mentioned was comparable to commercial rents in Toronto, and you live in rural Nova Scotia! What the hell are they thinking? A: I will answer anything! Haha! I have NO IDEA what they are thinking, other than probably “This lake-of-fire front property is too hot, let’s invest in new A/C and charge it to the small business owners in our rural buildings”?, because they are, collectively, Satan. Seriously though, with companies like the one that jacked up my rent, (through loopholes, two months after I moved in, with an increase of $600 a MONTH! ), I’m sure all they care about is the bottom line. They are so disconnected from the communities they own in, and they could care less. The community at large, along with myself, emailed, sent letters, called, did everything we could, and the owners still did not care. They stood their ground on the increase, and as a result I have almost gone out of business four times. In fact, they only sent me back one email saying “I’m not sure why we got these emails…”. I offered them some reading lessons. They didn’t answer back, haha. My building has since been bought by another company, who have their heads in the sand just as deep. We need locally owned, reasonably priced business buildings desperately in rural Nova Scotia. Or at least ones not owned by the four horseman of the apocalypse. Q: What’s the hardest part of running Cape and Cowl? A: The hardest part of running Cape & Cowl, is doing it all by myself. Although, it makes me quite proud to see all I have done. I certainly couldn’t have done it at all without the incredible amount of help I get from local community members, and volunteers for parties and events, but the daily grind can certainly wear on me from time to time. I am good at practicing self care, though, so I make sure to get the rest I need. When the shop closes up at 6:00, I go home. I don’t let anyone make me feel guilty for not being open past that. If they want to shop comics in the evening, they can do that in the city, or wait a few years until I have a staff to allow me to do so. The only other part that was difficult, was dealing with ALL the companies that call you to set up debit/credit payments with them. Boy, those companies are all headache-inducing, but only were so in my first year of business. I can tell them where to go pretty fast, these days, haha. Q:Do you have any big plans for the future? A: I have SO MANY big plans for the future, but I can’t tell anyone about them yet! Isn’t that awful?! haha All I can say is, stay tuned to the website, and you’ll see every big idea as I implement them! Q: What advice do you have for folks around North America interested in starting their own comic shops? A: Oh my gosh, I could write an hour’s worth of material here, but what I’ll say is this: do it. If you want to own a comic shop, go do it. Save as much money as you can, do your research about the comic industry, and how to order from your distributors. Go nuts on social media. Listen to everyone’s “advice”, but only use the advice you want. Comic shops work much better if you involve the community, so create events where the geek community can gather and cross promote with other local small businesses. Find small business meet-ups in your area, and get connected! And most importantly, remember that COMICS ARE FOR EVERYONE. How many times has some variation on this theme been thrown in the face of some well-intentioned person? They’re “just trying to understand”, and how can they do so if you won’t explain? As an upper middle class white dude, I remember asking such innocent-seeming questions myself, failing to appreciate what the Audre Lorde quote above explains: educating your oppressor is draining! I was lucky enough to have a kind and very patient friend to deliver a staggering series of savage defeats in debates I had imagined I’d won. It took years for the implications of her arguments to penetrate the murky sludge of privilege and teach me an essential lesson: it can be hard to understand what we do not experience. The experience of oppressed people and our difficulty in understanding it makes them an other, separate from us and outside our understanding. For those unfamiliar with this academic term, the “other” describes the relationship of those excluded or oppressed by a group or society by virtue of their identity. 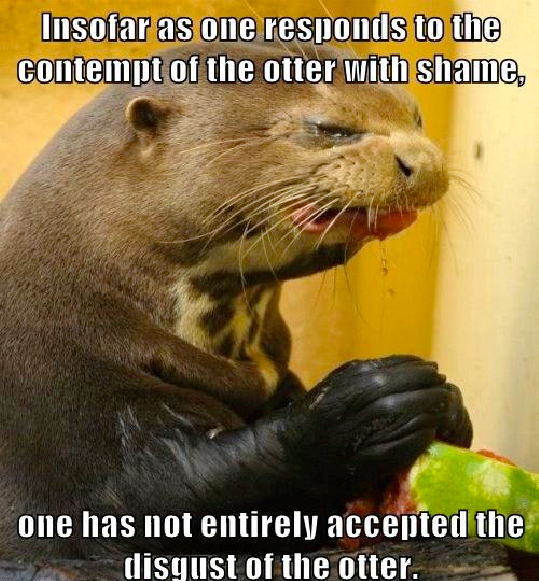 You know what they say where clarity’s concerned: “a .jpg is worth a blog post but a meme will do in a pinch.” So there’s a kind of emotional truth to the expressions of the otters linked above that we wouldn’t get from a graduate course on the subject. The appeal of a snarling otter over the excruciating tedium of a dozen French philosophers is obvious. This otter is asks us to go beyond feeling bad about our privilege and understand it is disgusted with our failure to do anything about it – or maybe just disliked that chewed up watermelon. But otters keep a busy schedule and can’t be everywhere! Luckily, there are comics. The internet has helped broadcast the voices of the oppressed to a wider audience than was previously possible. People who would struggle to get a speaking role on a third-string sitcom can have audiences in the hundreds of thousands, and comics are one of the most accessible media to do so. For regular people struggling to understand how their privilege can be harmful to otters, comics beat the heat of the librarian’s stare when your intellectual sweat starts to stain the aging furniture your local bibliotheque. Comics can be an excellent way to visually represent concepts that take ages to present in text. 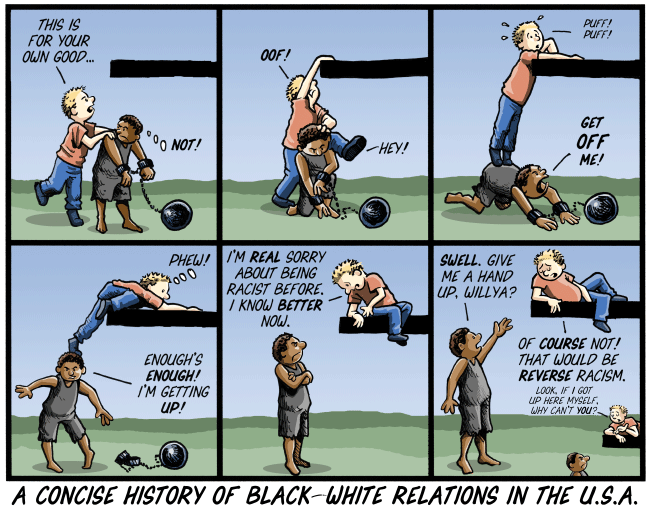 That’s 500 years of exploitation in six panels, and if it lacks the nuance of a textbook on the triangular trade, hey, it’s a starting point. An interested person with good intentions can proceed from here to Google, Wikipedia or the nearest library. It is the beginning of a frame of reference. Most importantly, it conveys an emotional truth. So much of oppression hinges on emotional truth. One can produce endless statistics on mortality rates during Atlantic crossings, the value generated by slaves for the American economy, the value of unpaid housework to the capitalist economy or whatever else suits you. But notwithstanding statistical significance, you know what they say: tell a human story, people can relate. If you want to bore them, use statistics. 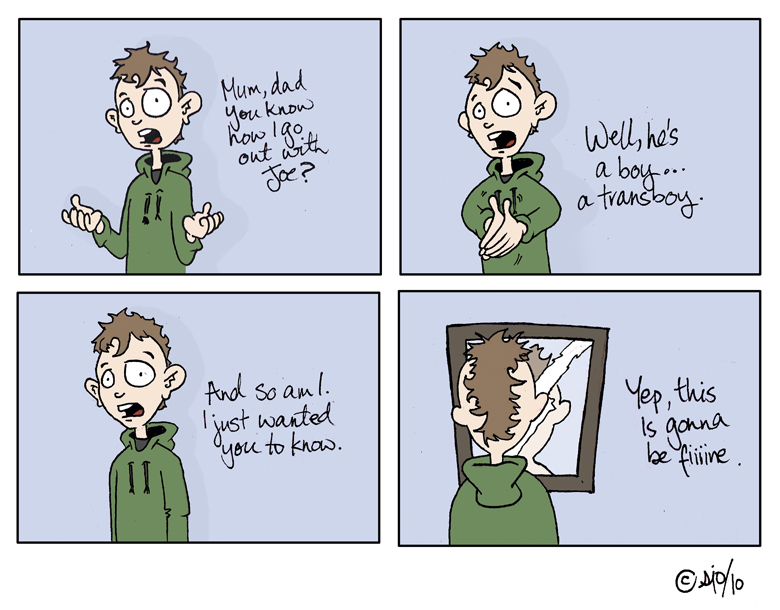 While there might be a startling brutality to statistics on trans suicides, many may find it easier to relate the above comic to their own experience of breaking difficult news to their parents. It is always the case when unpacking your privilege that a dash of empathy goes a long way, and if the personal is political it’s electrical too. So comics are a place to plug in, and that’s always good. 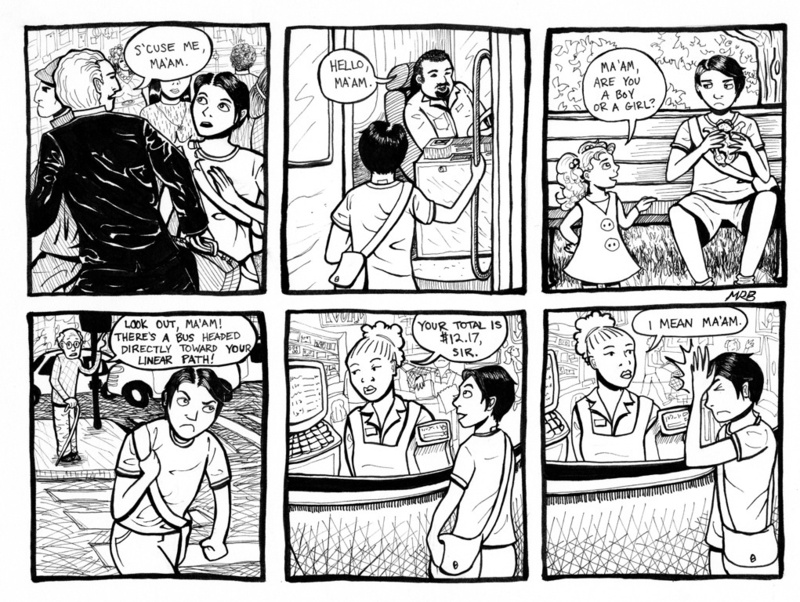 They can be especially effective when someone who shares your privilege uses comics as a way to speak directly to your experience, and acknowledges the frustration of being called out while you are trying to educate yourself. If this comes with two scoops of tough love, at least you can see yourself in the face of the person behind the pencil. Nothing, of course, is universal. But the beauty of comics are their incredible diversity. Not every comic will illuminate every question. Seeking understanding is catching fish with your bare hands, slippery at the best of times, without mediating that search through art. 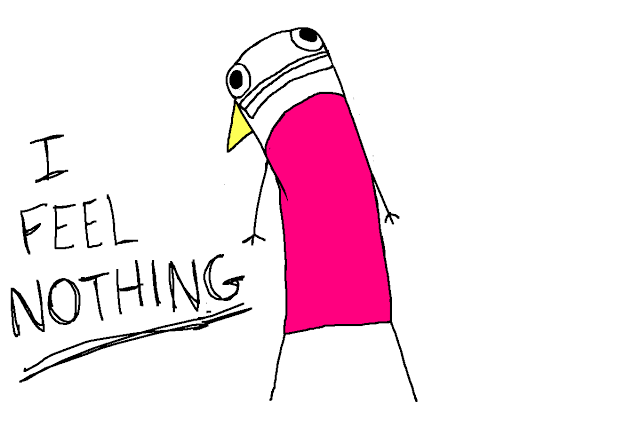 For those of us hoping to improve our allyship, it is alright to admit that we just don’t get it. Sometimes, we may have no reaction to a given comic at all. And that’s ok. In our journey to understand the differences that separate us, and the way our behaviour has the capacity to harm people, we do not need to instantly grasp every concept that’s presented. Some questions have answers you can’t put in comics, or books for that matter. Ultimately these are questions rooted in human experience and therefore best addressed through human interaction. Still, if you want to avoid putting your foot in your mouth and potentially hurting someone’s feelings, comics can be a great place to start. You never know whose life you might make a little easier. FRIDAY, JANUARY 31, 2014– Over forty cartoonists and illustrators from a dozen countries around the world released an open letter today to Franck Bondoux, director of the International Festival of Comics at Angoulême, asking the festival to drop its relationship with the Israeli drink manufacturer SodaStream. Among those signing the letter were French cartoonists Siné, Baudoin, Carali, and Chimulus, Americans Joe Sacco, Eric Drooker, Ben Katchor, Peter Kuper, Matt Madden, Seth Tobocman and Sue Coe, as well as Palestinian cartoonist Mohammad Saba’aneh, Lebanese Mazen Kerbaj, Sudanese Khalid Albaih, Tunisian Willis From Tunis, Israeli Amitai Sandy, Brazilian Carlos Latuff, Spanish Elchicotriste, Italian Gianluca Costantini, and many more. The letter comes as SodaStream increasingly is targeted by an international boycott due to the presence of its primary factory in the Israeli settlement of Ma’ale Adumim. The day before, headlines were made when actress Scarlett Johansson ended her seven-year relationship with the charity OxFam over disagreements stemming from her role as a paid spokesperson for SodaStream. The Angoulême International Comics Festival is the largest in Europe, and the second-largest in the world. The announcement that it would be sponsored this year by SodaStream drew immediate condemnation from French activists. We, cartoonists and illustrators from all countries, are surprised, disappointed and angry to find out that SodaStream is an official sponsor of the Angoulême International Comics Festival. As you must know, SodaStream is the target of an international boycott call for its contribution to the colonization of Palestinian land, due to its factory in the illegal settlement of Ma’ale Adumim, its exploitation of Palestinian workers, and its theft of Palestinian resources, in violation of international law and contravening international principles of human rights. Angoulême has had an important role in the appreciation of comics as an art form for over 40 years. It would be sad if SodaStream were able to use this event to whitewash their crimes. We ask you to cut all ties between the Festival and this shameful company.